Observation - Mandarin - UK and Ireland. 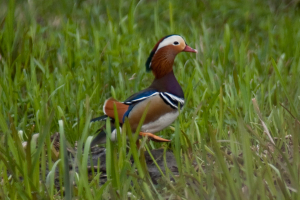 Description: Whilst Mandarins are not that difficult to find around Watford (Aldenham Country Park is a favoured spot), still surprised to find this single male on the River Colne near Moor Park. Whilst Mandarins are not that difficult to find around Watford (Aldenham Country Park is a favoured spot), still surprised to find this single male on the River Colne near Moor Park.